We are one-stop manufacturer for high quality plastic roofing materials and wall panels. As a highly specialized Chinese manufacturer, we are devoted to the development and fabrication of premium products such as Spanish ASA Synthetic Resin Tile, weatherproof ASA Roof Sheet, Anti-corrosion APVC Roof Sheet, Heat lnsulated UPVC Roof Sheet, PVC corrugated roofing sheet, FRP/UPVC transparent roof sheet, Heat insulated Wall Panel. These types of building materials are widely implemented for applications such as heat insulation as well as roof and wall construction in agricultural and industrial settings. A dedicated development team and more than 11 years of industry experience allow us to provide customers with professional OEM services. Our state-of-the-art production line enables and annual output capacity that exceeds 6,800,000 square meter. We are the leading roofing manufacturer with 3 branch factory and 13 production lines . We strive to provide Spanish ASA Synthetic Resin Tile, Heat insulated UPVC Roof Sheet and other high quality roofing materials at extremely competitive prices. All finished products have been thoroughly tested prior to shipping for guaranteed stability, durability. As a global supplier, we export worldwide to countries and regions including the Philippines, lndonesia, Thailand, Saudi Arabia, Oman, Egypt, Pakistan, ltaly, Guatemala, Ecuador, brazil, South America, Latin America, South Africa, West Africa, etc. With years of development and non-stop research, the brand name has earn reputation from clients of both domestics and aboard. Our products has passed the SGS and CQC international quality system certification testing, China Council for the promotion of international trade certification and so on. We will do our best as usual to provides excellent products and honest service. We believe that roofing is your best choice, we sincerely welcome you to become our partnership, and achieve win-win cooperation together. Welcome to join us. 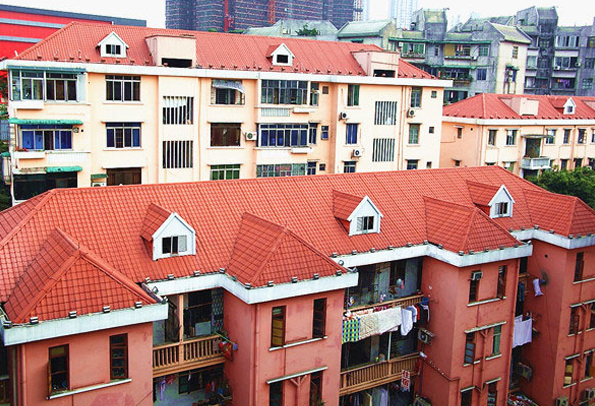 Plastic roof tile and roof sheet have outstanding weather resistance. They can effectively avoid color fading, color changing, and fracturing problems even when they are used under severe conditions with strong UV radiations, large temperature variations, as well as frequent wind and rain. Plastic roofing sheet have a thermal conductivity coefficient of 0.07 W/mK, which is approximately 1/6 that of cement tiles and 112200 that of 0.5mm color steel roof tiles. It has a good absorption of the noise effect, noise down 30dB than color steel tile. Due to superb anii-corrosion performance, chemical reactions won't take place even when our roofing sheets are immersed in corrosive solutions for continuously 24 hours. our products won't rust, which largely improves its waierproof performance. So our products are perfect for costal areas and place with frequent acid rain. Our products have very high loading capacity due to high thermal stability. Thermal expansion or contraction won't occur,even when they are applied in extremely temperatures -35'C to 60 'C. our products have no visible changes. Under low temperature, our products won't occur surface damage or fracture problems. Plastic roof panels have special external designs. This, combined with our patented waterproof accessories, make sure allfastening screws wont rust. Thus, outstanding water resistance is guaranteed. According to tests conduced by SGS, our products conform to the UL 94-2013 plastics flammability standard. They are proven to have flame rating at V0 or higher grade, and belong to non-flammable building material. All products don't contain asbestos or radioactive element, and they are recyclable.